I guess it depends on your point of view. Maybe it's the liberal elitist in me, but I want to know that the President of the United States gathers information from varied and challenging sources and then makes thoughtful, reasoned and logical choices in guiding this country. 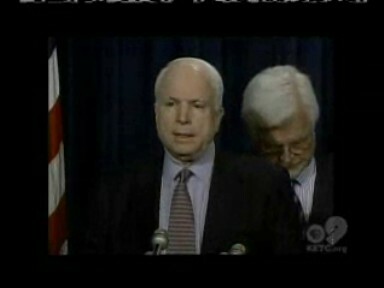 As is patently clear from both his Senate career and his friends and colleagues, that would not be John McCain. As his out-of-left-field choice of running mate perfectly exemplifies, John McCain is a gambler and a reactor, making decisions intuitively and quickly. That may work well in some arenas (although I'm hard-pressed to think of one other than the mentioned fighter pilot), but as President, what a recipe for a worldwide disaster. Especially considering how poor his intuition has served in critical areas like the economy. SEN. JOHN MCCAIN: As a politician, I am instinctive, often impulsive. FORMER SEN. GARY HART (D), Colorado: On a scale of pure intuitive, pure impulsive versus pure cerebral, pure analytical, I'm putting him very much on the former end. See, the problem with this approach is that McCain is not the only person forced to live with his consequences and that's where all voters should be concerned. Further, as his own Chief of Staff proudly admits, McCain serves no other master than himself, refusing to commit to his party leaders or even participate in their organization to push legislation. MARK BUSE: The Senate leadership used to get very frustrated with him when they would do their whip checks, their vote counts in advance of votes. He wouldn't answer. He wouldn't give an answer. His answer would be, "I'll vote how I want to vote." He wouldn't let them count his vote necessarily. He doesn't do the daily attendance check. MARK BUSE: In the Senate, every morning, they check to see what numbers are there so that they know what might happen. We don't respond to that. Hard to buy that whole "Country First" crap when he's shown over his entire Senate career that it's "McCain First". JUDY WOODRUFF: McCain has long been described as a maverick, a title he's happy to brandish. As evidence, he touts his work with Democrats on issues like campaign finance and immigration reform. McCain staffers describe a boss who makes decisions outside of partisan pressures. MARK BUSE, Chief of Staff, McCain Senate Office: He has a concept of party. He believes in his party, but he's more than happy to cross the aisle. And he does it all the time to the anguish of those who demand party unity. JUDY WOODRUFF: Mark Buse is McCain's Senate office chief of staff. Buse started working for the senator 17 years ago as an intern. MARK BUSE: The Senate leadership used to get very frustrated with him when they would do their whip checks, their vote counts in advance of votes. He wouldn't answer. He wouldn't give an answer. His answer would be, "I'll vote how I want to vote." He wouldn't let them count his vote necessarily. He doesn't do the daily attendance check. MARK BUSE: In the Senate, every morning, they check to see what numbers are there so that they know what might happen. We don't respond to that. While he respects the leadership, he respects their jobs, he's not there to serve them. JUDY WOODRUFF: Republican Jon Kyl, the other Arizona senator, has known McCain for over 20 years and says much of McCain's decision-making style can be attributed to his military experience. SEN. JON KYL (R), Arizona: I think, partly as a result of his background in the United States Navy and partly because of his personality and his disposition, John goes a lot on instincts. He's peripatetic. He covers a lot of ground in a short period of time. And so he's not one to sit around, and ponder, and wring his hands, and try to figure out what the right thing is. He's got an idea right off, and then he'll take advice from his advisers, his staff, and others around him, but he makes a judgment relatively quickly, sticks with it, doesn't look back. And in that sense, he's a leader that bases a lot of what he decides on his instinct, on his judgment, and his sense of what's right and wrong and proper. JUDY WOODRUFF: As an example, Kyl points to an international crisis that flared between Russia and the Republic of Georgia. SEN. JOHN MCCAIN: Today, we are all Georgians. SEN. JON KYL: John McCain immediately had an idea of what was right and wrong. He immediately had a view about what should be said about it in criticism of the Russian invasion, and he did it. He didn't get any advice from advisers on that. That was pure John McCain. JUDY WOODRUFF: In his book, "Worth the Fighting For," McCain himself describes his instinctive approach. JUDY WOODRUFF: McCain goes on to say, "I don't torture myself over decisions. I make them as quickly as I can, quicker than the other fellow, if I can. Often, my haste is a mistake, but I live with the consequences without complaint." But that quick-to-decide approach gives pause to some. Former Colorado Democratic Senator Gary Hart, a one-time presidential candidate himself, befriended McCain when McCain was the Navy liaison to the Senate. Hart later served as a groomsman in John and Cindy McCain's wedding. Now, he's a smart guy or he wouldn't be where he is, but I don't think -- I think he'd be the first to say he's not a rocket scientist or a pure analytical brain, if you will. I think he, John, reacts to things. JUDY WOODRUFF: Hart says he has great respect for McCain but is supporting Barack Obama for president. GARY HART: I have hesitation, probably would have were John McCain a Democrat, about a personality in the Oval Office who is more impulsive and intuitive, if you will, than analytical and thoughtful. Now, John McCain is not seat-of-the-pants. I'm not -- I don't want to give the impression that he just -- whatever he had for breakfast makes the decision of going to war. It's not quite like that. But I think, again, on a scale, I'd prefer somebody who's a little more thoughtful, a little less impulsive, and a little more analytical. JUDY WOODRUFF: Long-time Congress-watcher Norman Ornstein worked alongside Senator McCain on campaign finance legislation. NORMAN ORNSTEIN, American Enterprise Institute: John McCain is a fighter pilot. A lot of his persona comes from being a fighter pilot. This is a man who not only constantly questions authority, but is fond of making last-minute, from-the-gut, impulsive, risk-taking decisions, and believing to his bones that there may be a risk here, but it will pay off. An impulsive decision-making style is fine if you're riding a jet. An impulsive decision-making style is fine if you're piloting a jet in combat. It's fine if you're a senator where the consequences are not going to be that long-lasting. It's a real question mark when you move into the presidency.